Aim: To use periocular flaps for defects involving different zones of eyelid. Materials and Methods: This study was conducted from 2015 to 2017. Twenty four patients with lid defects were managed by cheek rotation and advancement flap(8), Limberg flap(5), forehead flap(5), Mustarde's lid switch flap (3), primary closure(1), SSG(2). Thirteen of our patients suffered from carcinoma, BCC(9) and SCC(4), patients with benign lesions had congenital melanocytic nevi(3), vascular malformation(2), congenital coloboma(3), cleft lower eyelid (1) and post traumatic eyelid defect(2). Eleven patients had full thickness defects and the rest had defect involving the anterior lamella. Result: Cheek rotation and advancement flap gave good results for anterior lamella, full thickness defect of zone II and adjoining periocular region with inconspicuous scar but ectropion in 2 cases. Limberg flap was used for defect involving lateral part of upper, lower eyelid and canthal region. In one case wound dehiscence occurred. Forehead flap gave linear scar. Mustarde's lid switch flap was an ideal flap giving minimal donor site morbidity. All flaps survived with adequate coverage and uneventful healing. Conclusion: Periocular flaps are reliable, versatile flaps for reconstruction of all five zones of eyelid with good donor scar, colour and contour match. We present a series of 24 patients with eyelid defects who were operated at our department from July 2015 to February 2017. Thirteen patients suffered from carcinoma, basal cell carcinoma (9), and squamous cell carcinoma (4). Patients with benign lesions had congenital melanocytic nevi (3), vascular malformation (2), congenital coloboma (3), cleft of the lower eyelid (1), and posttraumatic eyelid defect (2). Eleven patients had the full-thickness defect and the rest 13 had partial-thickness defect involving only the anterior lamella. The average age of our patients was 39 years (range: 9–76 years). In eight patients, cheek rotation and advancement flap was used. In five patients, Limberg principle of tissue transposition was followed, and the donor area was primarily closed. In five patients, forehead flap was used. In one of these patients who was a known case of xeroderma pigmentosum, the tumor was 4 cm × 5 cm in size involving the lateral canthus and upper and lower eyelids with adjacent periocular area, for which a laterally based forehead flap was used and the donor area was split skin grafted. In three cases, Mustarde lid switch flap was done for defect in the upper eyelid (25%–50%), and the donor area was primarily closed. In one patient, the defect was <25% of eyelid length and it was primarily closed. For large lesion due to vascular malformations (1) and congenital melanocytic nevi (1), defect was resurfaced with thick split-thickness skin graft (SSG) [Table 1]. Cheek rotation and advancement flap gave good results for anterior lamella, full-thickness defect of Zone II, and adjoining periocular region. Donor scar was inconspicuous with tendency of ectropion (2) if the flap was not tugged at the infraorbital region [Figure 1] and [Figure 2]. Limberg principle of transposition was used when the defect was involving the lateral part of the upper and lower eyelid and canthal regions. Donor scar was kept along the Langer's line, resulting into minimal complaints regarding scars [Figure 3]. In one case, wound dehiscence occurred which was managed conservatively. Forehead flap gave linear scar on forehead when based on supratrochlear artery. In one case, we used laterally based forehead flap where the donor area of the flap was skin grafted. Contour deformity, color mismatch, and dryness were complained by patients in whom a thick skin graft was used to cover the eyelid or the flap donor area. In one case of thick SSG, mild ectropion developed due to lack of proper follow-up. Mustarde lid switch flap was near to ideal flap, giving minimal donor-site morbidity [Figure 4]. The main disadvantage was two-stage procedures. 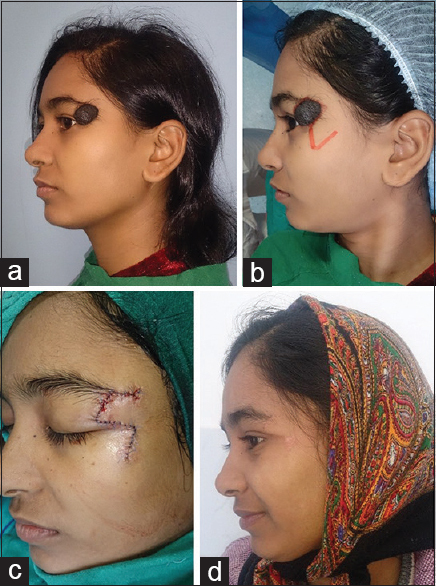 Debulking of forehead flap was done in three patients approximately 6 months after surgery on patients' demand. All the flaps survived with adequate coverage and complete wound healing. In three cases, distal congestion was present which was managed conservatively. Eyelid defects can be congenital, posttraumatic, or may result after excision of tumors. Irrespective of the etiology, the defect must be evaluated depending on the zone or zones which it is involving and whether the defect is involving the anterior or the posterior lamella of the eyelid or both. The quality and quantity of locoregional and distant tissues are evaluated. Defects created by an ablative procedure may not be amenable to reconstruction and may be reconstructed after permanent pathological confirmation regarding adequate margin. Any plan for adjuvant treatment such as radiation should also be considered. Eyelid defects resulting from trauma rarely occur in isolation. It is important to ensure that all associated injuries have been properly identified and accounted for. Principles of reconstructive ladder were followed. Adequate soft-tissue coverage of the eyelid and periocular region is particularly important because of the complexity of form and function of the region. Flaps are necessary for coverage of exposed cornea, sclera, tarsal plate, or conjunctiva. 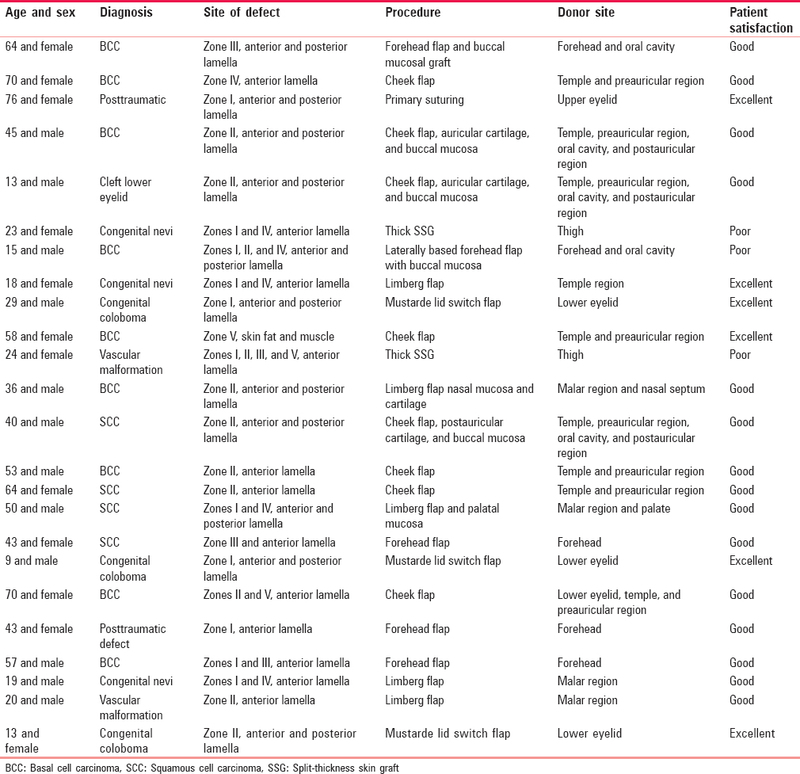 Evaluation and treatment of eyelid defects are best approached by dividing the region into zones each with its own anatomic, functional, and esthetic considerations., Evaluation of defects with respect to the location or zone and the extent to which each zone is affected (anterior or posterior lamella or both) may also be predictive of possible postreconstructive complications. These zones are upper eyelid (Zone I), lower eyelid (Zone II), medial canthal region (Zone III), lateral canthal region (Zone IV), and periocular region (Zone V). Simultaneous reconstruction of canthal and eyelid defects. Scar and deformity at the donor site. Partial-thickness defects involving skin and muscle are divided into two categories: those <50% of eyelid length are managed by local advancement, rotation, and transposition flaps and the scars when possible are oriented in transverse direction and defects >50% in eyelid length are conventionally managed by full-thickness graft, which is harvested from contralateral upper eyelid,,, postauricular region, and lower part of the neck or lateral groin region. The donor area is primarily closed. When a defect is resurfaced with a full-thickness graft or a thick SSG, there is definitive color and contour mismatch as compared with the surrounding area. Chances of ectropion of the upper or lower eyelid as a complication in the early and late postoperative periods cannot be ruled out. To overcome these problems, we have opted for thin flap from the periocular region which was used for reconstruction of partial-thickness defects as an alternative option. Limberg flap is routinely used for defects in the face, pressure sores, and pilonidal sinuses of the sacral region., Limberg flap is a versatile procedure in terms of design and surgical execution and was used for small-to-medium sized defects of Zone I, Zone II, Zone IV, and Zone V. The arterial supply of the Limberg flap is through the subdermal plexus. The random pattern supply permits flap layout in any configuration. Excision of defect was planned in a rhombic fashion. The minor angle should be kept at 60° for optimal Limberg flap transfer. The flap was oriented so that the donor-site scar fell into the lines of maximal extensibility. As wound closure was achieved, normal skin tension was restored. This flap is an excellent option for small-to-medium sized defects with minimal donor-site scar for defects in the eyelid and periocular region. For full-thickness defects up to half of the upper eyelid, we used skin muscle tarsoconjunctival (Esser) flap from the lower to upper eyelid which was not more than one-quarter of its width (approximately 6–7 mm) so that the lower eyelid (donor flap) defect was primarily closed. Division of the pedicle was done 3 weeks later. This flap can be used for defects between half- and three-quarters of the upper eyelid as well as for subtotal and total defects of the upper eyelid in combination with cheek rotation flap for lower-eyelid reconstruction. This is an ideal procedure by which anterior and posterior lamella are reconstructed simultaneously with achievement of functional eyelid., Forehead flaps based on supratrochlear vessel or laterally based on anterior branch of superficial temporal artery can provide significant amount of tissues for reconstruction of defects resulting from excision of large tumors of eyelid involving Zones III, IV, and V. They are robust flaps with good vascularity. The main disadvantages are two-stage surgery and donor-site morbidity. In all the above-mentioned flaps used for reconstruction of either the upper or lower eyelid, septal cartilage with mucosa, buccal mucosa, or palatal mucosal graft was used for lining. Debulking of flaps can always be done approximately 6 months after surgery if the patient so desires. Carraway JH. Reconstruction of the eyelids and correction of ptosis of the eyelid. In: Aston SJ, Beasly RW, Thorne CH editors. Grabb and Smith's Plastic Surgery 5th ed. New York: Lippincot Raven; 1997. p. 529-544. Spinelli HM, Jelks GW. Periocular reconstruction: A systematic approach. Plast Reconstr Surg 1993;91:1017-24. Hayano SM, Whipple KM, Korn BS, Kikkawa DO. Principles of periocular reconstruction following excision of cutaneous malignancy. J Skin Cancer 2012;2012:438502. Jackson IT, Eyelid and canthal region reconstruction. Local Flaps in Head and Neck Reconstruction. St. Loius: Quality Medical Publishing; 2002. p. 273-326. Meissner M, Hofmann W, Kaufmann R. Reconstructing of the upper eyelid: Full thickness skin grafting between the same contralateral aesthetic units. J Ger Soc Dermatol (JDDG) 2016;14:319-20. Mustardé JC. Reconstruction of eyelids. Ann Plast Surg 1983;11:149-69. Spinelli HM, Forman DL. Current treatment of post-traumatic deformities. Residual orbital, adnexal, and soft-tissue abnormalities. Clin Plast Surg 1997;24:519-30. Limberg AA. Design of local flaps. In: Gibson TA, editor. Modern Trends in Plastic Surgery. London: Butterworth; 1966. p. 38-61. Spinelli HM, Suzman MS. Soft tissue deformities in orbital trauma evaluation and repair of medial and lateral canthal injury. J Oper Tech Plast Reconstr Surg 2003;8:249-58. Spinelli HM, Atlas of Aesthetic Eyelid and Periocular Surgery. Philadelphia: Elsevier; 2004. Spinelli HM, Sherman JE, Lisman RD, Smith B. Human bites of the eyelid. Plast Reconstr Surg 1986;78:610-4. Lister GD, Gibson T. Closure of rhomboid skin defects: The flaps of Limberg and Dufourmentel. Br J Plast Surg 1972;25:300-14. Koss N. The mathematics of flaps. In: Basic Science in Plastic Surgery an Educational Foundation Symposium. St. Louis: Mosby; 1979. p. 274-83. Subramanian N. Reconstructions of eyelid defects. Indian J Plast Surg 2011;44:5-13. Giuseppe DA, Albert YW. Hard palate graft for repair of eyelid notch deformity. Vis Pan Am 2015;14:58-60. Mustarde JC. Repair and Reconstruction of the Orbital Region. 2nd ed., Ch. 9,7,11. Edinburg: Churchill Livingstone; 1980.